Suppose you could buy an iPad for $38, read OverDrive library books, even hear text to speech from them, and enjoy Kindle books, too. And how about social media, photos, basic video chat, and production of low-res videos? What if you could even use voice recognition to dictate e-mail or other documents for work or school? 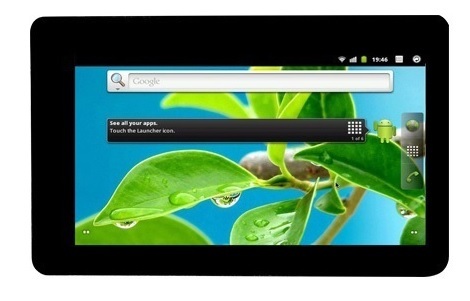 Well, Datawind’s $38 UbiSlate 7Ci tablet is no iPad and runs Android 4.2.2 rather than Apple’s iOS operating system. But in so many ways, the 7Ci comes tantalizingly close if you use third-party apps, know how to set them up right, and can put up with this econo-tablet’s quirks. Psst! The UbiSlate even works with Chromecast, so that, with crystal clarity, you can “broadcast” Netflix movies, YouTubes, and other goodies to your large-screen TV and not limit yourself to the tablet’s own resolution. I’ll share some Ubi-related tips beyond the ones here—I’m not certain exactly when this week. Update, Jan. 21, 2014: After more testing, I’m giving the UbiSlate 7Ci a thumbs-down. Its defects seemed manageable until I ran into the AdWare problem, as detected by AVG, which could only delete one of the offending files. What a shame, given the UbiSlate’s many positives. I was expecting some advertising, but the UbiSlate’s ads are stealthy horrors and might be one reason why performance could be better. While offering econo-tablets and related guidance to the poor, libraries can add real value by paying attention to not-so-minor details such as privacy and security in general. – D.R. Yes, over the weekend, I managed to do the OverDrive act, TTS and the rest, aided by built-in access to the Google Play store. My eyes and a lookup of pixels-per-inch statistics (132 for the first and second generation iPads, 133 for the UbiSlate) confirmed that we’re really in iPad territory in some reassuring ways for e-book lovers. A photo ahead, showing the start of David Copperfield on a UbiSlate screen, lets you see for yourself. The UbiSlate in this case is running OverDrive Media Console in all-bold, the most viewable style in my opinion although the plain mode is adequate. In real life, the view is actually better. Double-click on the photo of the display, and you’ll come closer to the level of sharpness. Please note my caveats about the UbiSlate despite my enthusiasm for its price-performance ratio. No Bluetooth. No Retina display. No incredible PDFs. 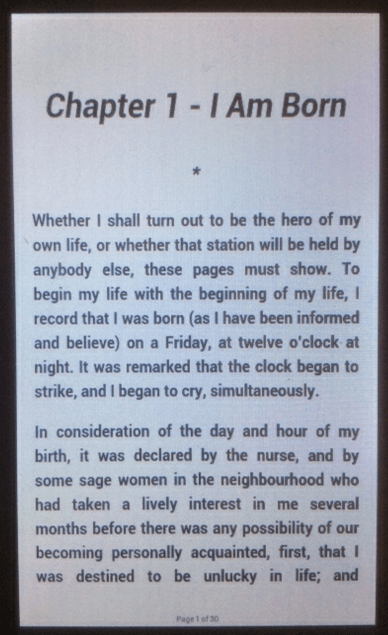 No sharp renditions of source pages when you’re running Google Play Books even though the reflowable-text view is fine. And the 7-inch, 800 x 480 TFT LCD display is smaller than the 9.7-inch, 1024-by-768 displays on the older iPads, and as for vibrant colors and super-wide viewing angles—forget about them. Also, be prepared for a bunch of error messages when you’re installing software. 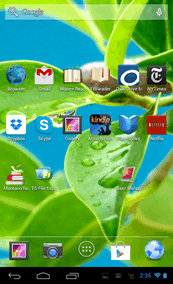 Running certain apps, you’ll see them more often than on an Apple tablet running iOS equivalents. Furthermore, whether browsing or using the Kindle program, you’ll probably find the UbiSlate to be sluggish compared to iPads. The sub-mediocre video cam is like the proverbial dog walking on its hind legs—the miracle is that it can do anything at all. And the design is clunky, the reason why the first image for this post is a screenshot image rather than a picture of the UbiSlate. Also, the date and time on occasions have been wildly off. My fault or Datawind’s? What’s more, your UbiSlate may not arrive within about a week, as mine did. Negatives or not, however, the UbiSlate impresses. Mantano Reader, the key to using TTS with OverDrive books, so far has run just great. The Kindle app, while a pokey starter, is faster once you’re in a book; would that it had Mantano’s read-aloud capabilities (at least for titles so allowed by publishers)! The Ubi’s 512MB of RAM is the same as the iPad 2’s and double that of the first-gen iPad. Internal storage is a mere 4GB, but a microSD slot lets you expand it to 32MB, or twice the minimum for iPads; I myself did not use an add-on card. Unlike the first iPad, the UbiSlate has a camera even if the resolution is a mere .3 megapixels. The screen uses capacitive touch and is surprisingly responsive for one on a $38 machine even though it times you may need to resort to multiple taps. The build is good for the price. Of course, I wouldn’t mind if the power plug slid in all the way, reducing the risk of bending or maybe even breaking. The UbiSlate’s CPU, a 1GHz Cortex A8 processor, is adequate; just remember, the big focus here—on e-books, not games. The 802.11 b/g/n WiFi works well with my Almond router. Battery life is several hours. I haven’t made any precise measurements, but given the price, I’ll keep my expectations low. So what’s the bottom line, from the perspective of librarians and patrons? 1. Libraries should not buy boatloads of UbiSlates right now. But even librarians in small systems should set aside the $38 for themselves or their resident geeks to experiment with the UbiSlate, since better and cheaper models will be on the way from Datawind and other vendors. Throwaway-priced tablets exist. Get used to them. If you’re prepared with the right kind of technical support and encouragement, this will be an opportunity to bring people closer to your library. Stop worrying so much about freakin’ turnstile counts. And show some empathy, please, toward the millions of young people who must wait half an hour or longer for an in-library computer—only to use it with the clock ticking and find they still haven’t managed to complete their school papers. If you work at a library and your boss or local public officials won’t make the money available for experiments with hypercheap tablets, try local Friends groups or seek grants if allowed. If nothing else, spend the $38 yourself. LibraryCity’s forthcoming guide can help you get off to a nice start if you’re willing to put in the time to install decent apps. 2. I don’t just mean to experiment technically. Loan out UbiSlates to patrons for feedback. Set up the tablets with the right apps and provide enough documentation and other support and encouragement. Quick videos, maybe? The real solution is for librarians to come up with their own apps well-integrated with the hardware. But meanwhile, imagine the benefits of a UbiSlate for a bright teenager who lives in a dangerous urban neighborhood and can’t hang around the library at night. She or he could write school papers both at the library and home—a triviality for many smart young people in this era of Gmail and Dropbox. Mention of the young is rather fitting; the UbiSlate is also known as India’s Aakash-3—created for cash-strapped students in developing countries. 3. Librarians need to see library-controlled hardware/software combos as a “must” if they’re to create their own ecosystems to survive Amazon and friends. Yes, the ecosystem should be accessible through apps alone, running on a number of machines from scads of vendors. But don’t forget the need to make life as simple as possible for patrons desiring a well-packaged, Kindle-ish approach. Just as Amazon does, by the way, libraries could offer both E Ink- and LCD-based options. 4. No, librarians won’t be guilty of mass malpractice if they fail to work toward the time when low-income patrons can own UbiSlate-style machines themselves. But it’ll be close. Long-term, it’s the most decent and cost-effective thing to do when the hardware is at the right level. I know, I know. Lots of otherwise smart people still don’t understand the cost-justification and think that the Almighty will take offense if low-income folks don’t work for their machines. But please—practicality here over so-called morality. First off, the most cash-strapped patrons actually would be working for the UbiSlates, by participating meaningfully in library activities of various kinds and by demonstrating knowledge of the machine. Still hate giveaways? Then why have public libraries? Horror of horrors, you generally don’t pay a librarian a nickel for helping you, and in the end aren’t their services worth a lot more than $38 over your lifetime? Third, there is the health angle in particular: let’s hotspot the sickest, too, in our quest to drive down healthcare costs. We’re spending billions in extra Medicaid costs because poor people have trouble absorbing doctor’s instructions, just as many middle and upper-class people do. It does not help that older people have trouble remembering to take their pills. UbiSlate-style machines with the right software could remind them. They could also offer plain-English or plain-Spanish explanations not just in text but also video—and I’m not just being theoretical here, having tested YouTube myself onUbiSlate. I encountered pauses during caching, but the UbiSlate’s video was certainly adequate for basic health education, and newer econo-machines from Datawind and other vendors won’t have such problems, especially as Net connections improve. Given all the lives and money that the right mix of hardware, software content and library-facilitated education could save, you might just about think of free UbiSlates as a variant of passing out free condoms. Except there’s a difference. You don’t have to be pro-birth control to believe in the UbiSlate-style approach. I’ve thrown in the “-style,” by the way, so it’s clear I’m not recommending one company’s product as a permanent, universal solution. Fourth, though actually as important as Two and Three, parents could use videos to learn how to read to their children and develop the kids’ cognitive abilities in other ways—check out the videos from Colorado if you haven’t already. As for the ability of UbiSlates to display texts adequately, I’ve already covered that. It can. I would welcome a larger screen, but that will be coming eventually for the $38 machines and almost surely cheaper ones. Enough of the analysis-and-visionary routine. Now—on to some detailed Ubi-tips in the next installment of this two-part series. Roundup of other UbiSlate reviews: Here. Is the UbiSlate really the world’s “cheapest tablet,” as some say? I don’t know. If nothing else, however, it is among the least expensive practical ones. If you want more features, especially for connectivity beyond WiFi, check out other models from Datawind. Note: This is a “first edition,” and various corrections and other tweaks may come time.